ADCP and CTD data were acquired by R/V Science I, supported by the Major Project of National Natural Science Foundation of China (grant 40890150) and the National Key Basic Research Program of China (grants 2007CB411802), under the NPOCE program. The moorings are located at 8°N,127.3°E off Minanao Island from 2010/12/01 to 2012/12/09, and 18.0°N,122.7°E to the east of Luzon Island from 2010/11/20 to 2012/10/30. The Acoustic Doppler current profiler (ADCP)data were interpolated into standard level in vertical with 10 m interval. Four CTDs are located at 400m, 550m, 700m and 850m at the (8°N,127.3°E) mooring. Both ADCP and CTD are averaged as daily data. The copyright of the mooring data at (8N,127.3E) belongs to Dunxin Hu/IOCAS, and that at (18N,122.7E) belongs to Dunxin Hu/IOCAS and Lixin Wu/OUC. If you want to download the above data, please sign and send to our administrator in the documents in the attachment, then you will receive the website login user name and password,After landing http://npoce.qdio.ac.cn/ please click the following URL: http://npoce.qdio.ac.cn/moored to login our website and download the required data. Now you are not authorized to access this data download. Do not have an account? Apply now. Hu D., S. Hu, L. Wu, L. Li, L. Zhang, X. Diao, Z. Chen, Y. Li, F. Wang, and D. Yuan, 2013, Direct Measurements of the Luzon Undercurrent, J. Phys. Oceanogr., 43(7), 1417–1425. Zhang, L., D. Hu, S. Hu, F. Wang, F. Wang, and D. Yuan (2014), Mindanao Current/Undercurrent measured by a subsurface mooring, J. Geophys. Res., 119, doi:10.1002/2013JC009693. 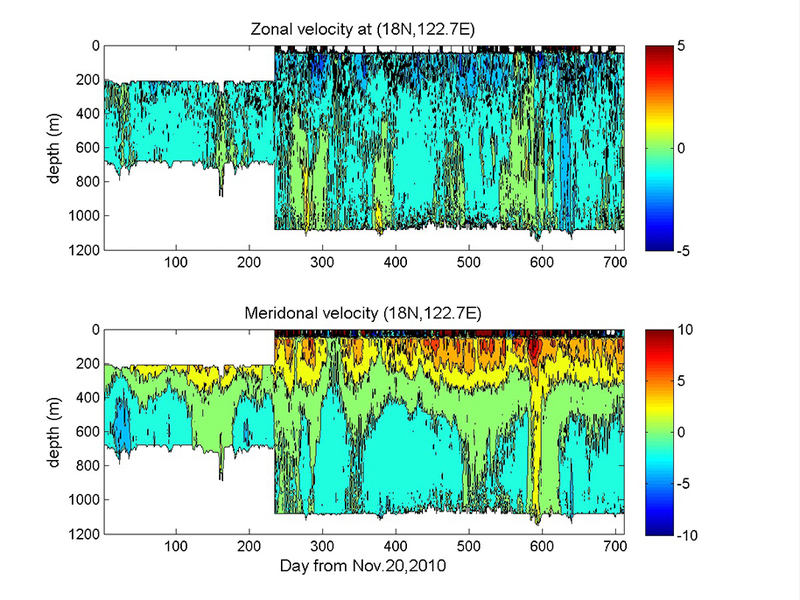 Chen, Z., L. Wu, B. Qiu, L. Li, D. Hu, C. Liu, F. Jia, X. Liang, 2015, Strengthening Kuroshio observed at its origin during Nov. 2010-Oct. 2012, J. Geophys. Res, doi: 10.1002/2014JC010590. Hu S., D. Hu, C. Guan, F. Wang, L. Zhang, F. Wang, and Q. Wang, 2016, Interannual variability of the Mindanao Current/Undercurrent in direct observations and numerical simulations, Journal of Physical Oceanography. doi:10.1175/JPO-D-15-0092.1.